What's the difference between a leader and a follower? In the manufacturing industry it's innovation, creativity, efficiency, and having the stamina to weather the storms. That work ethic doesn't come from out of the blue. It's a learned process developed over years of dedication in creating quality products and understanding your customer, while navigating the turning currents of the industry. Building something substantial takes time and sweat. Mike Cayley, Sr. is no stranger to the hard work required to produce exceptional results. Spending his childhood learning how to build relationships with customers in his father's hardware store, he understands the value of anticipating what customers may need. These skills, coupled with the discipline he developed in the US Navy, set the foundation for building a successful business. 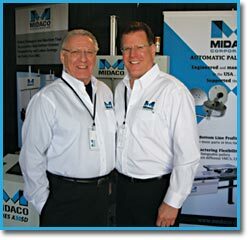 After being honorably discharged, continuing his education in engineering, and working in sales, Mike and his buddy Dave O'Laughlin decided it was time to strike out on their own and started MIDACO (the MIke and DAve COmpany). Initially setting up a machine job shop in Rosemont IL, MIDACO machined its first part on a manual engine lathe in June of 1969 - a quantity of 10 steel shafts for an oil pump drive at a price of $159.00 ea. A few years and several job shop orders later MIDACO moved to their current facility in Elk Grove Village on April Fools Day in 1973. Not foolish in his business decisions, Mike amicably bought out Dave a year later and purchased MIDACO's first Computer Numerical Controlled (CNC) machine tool. With the advent of computer programs in the 1970's, CNC machine tool controls transformed the culture of American manufacturing by revolutionizing the machining process. It became just as simple to cut a curve in a piece of aluminum as it was to cut a straight line. CNC machining, initially adopted by huge corporations doing mainly aerospace work, began to trickle down to smaller corporations manufacturing a variety of products. The ability to manufacture parts with these new technologies sustained MIDACO through the economic recession of the 1970's. As the economy was rebounding in the 1980's MIDACO's work was plentiful. So plentiful, in fact, that by 1991 they needed to figure out how to keep up with their customers' demands. They already had the latest state-of-the-art technology in their machine shop and there was nothing on the market that could increase their production. They needed to create the next level of manufacturing efficiency themselves. The second generation of "Cayley", Mike Cayley, Jr., came up with an idea... rather than spending valuable time securing individual parts on the table in the machining center while it's idle, do it outside the machine on a flat aluminum pallet while the machine is running another job, then quickly switch out the pallet. This concept greatly increased MIDACO's productivity and decreased the machine tool spindle downtime. The Micro Pallet Change System (MPS-31) was born. MIDACO began it's transformation from a job shop to an original equipment manufacturer (OEM) producing Pallet Change Systems for the growing CNC machine tool industry. 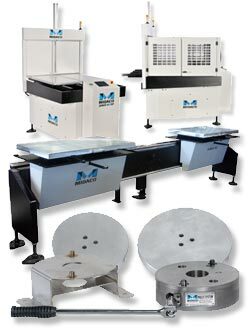 The demand for larger size CNC machining centers was growing, as was MIDACO's product line. Being a business of foresight and valuing their customer's needs, they wanted to provide an added benefit in production... MORE SPEED. By 1995 they had dramatically decreased the time needed to manually change over parts in a machining center. What originally took an operator 10 minutes to do, now took only 25 seconds with a manual pallet changer. But in manufacturing even 25 seconds of down time several times throughout the day adds up to significant time and money wasted in production annually. The goal was to keep the cutting tool in the part as much as possible and the metal chips flying. MIDACO began developing a fully automated version of their pallet change system and researched servo drive mechanisms to increase speed. A new century rolled in and so did a full line of Automatic Pallet Changers. Today they make pallet changers to fit every size and model CNC machine... they even have a system with a pallet change speed of 6.5 seconds... how's that for efficiency! Coming from a modest upbringing and building a business from scratch, Cayley recognized that with success also comes responsibility. During years of growth and survival through economic hardships he felt a need to provide for the village his company called home. Back in 1986 MIDACO set up a non for profit organization called Happy Memories, Inc. through which they collect donations from other neighboring businesses and friends. Their vision has been to help feed those who have fallen on hard times, especially during the Holiday Season, and share the joy of Christmas with presents for local children. With the help of volunteers, 100% of all they collect goes to providing needy families living in Elk Grove Village and surrounding suburbs with food, new clothing, new toys, and a Christmas party with dinner and entertainment. Initially the guest list included 50 local children and their families. By the mid 2000's that list increased to almost 300 individuals, of which over 220 were children. In recent years with increasing number of families being out of work, Happy Memories Inc. decided it was more beneficial to focus all their resources on providing urgent needs rather than throwing the annual party. After 25 years in operation, Happy Memories maintains the desire to benefit needy families and continues to give 100% of all their collections to local food pantries. 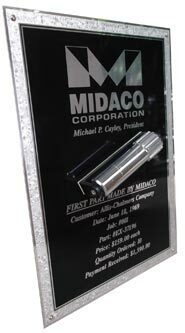 Over 42 years have gone by since MIDACO made that inaugural steel shaft. It's hand drawn blue print, original purchase order and invoice #0001 is proudly displayed in Mike Cayley's office as a reminder of the first humble step on a path leading toward success, and what that growth has been able to provide for the Elk Grove Village community. Today they make products that were never imagined when the company was first founded and sell all over the world. The next generation of the MIDACO family works in eager anticipation of what lies ahead.